Overdoses by people taking paracetamol for toothache have lead to more than 150 admissions at one hospital. 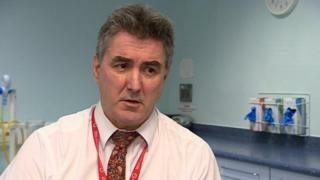 Of 436 such cases at Nottingham's Queen's Medical Centre A&E, more than a third were accidental overdoses caused by attempts to relieve dental pain. A two-year study said these patients risked serious liver damage and cost more than £50,000 in admissions alone. The British Dental Association said lives had been put "at risk" by a "failure" to provide emergency care. The study's authors said the dangers "are not fully appreciated by patients, dentists or GPs", and called for more information about safe levels of paracetamol and greater emergency dental cover. A standard 500mg tablet should only be taken eight times in 24 hours, with as few as 10 tablets potentially causing liver damage. Study co-author and consultant Andrew Sidebottom said the situation was "a concern". He said: "People are saying, 'I will exceed the eight tablets-a-day because my pain is not being controlled' and take two, and another two and another. "But that additive effect was causing more problems than a single big dose - and the damage can take several days to have an effect." He added the "fear factor" over going to dentists played a part, but emergency cover was also often "overbooked" which made getting treatment difficult. Henrik Overgaard-Nielsen, the British Dental Association's chair of general practice, said: "Failure to invest in both routine and emergency dental care is jeopardising appropriate diagnosis and treatment, and heaping needless pressure across the NHS." NHS England said it was "not aware of any current difficulties" in accessing treatment in Nottinghamshire, and urged patients to report any issues.